FlyingEyes realizes free-space camerawork and content creation using autonomous aerial vehicles. Recently, highly effective 3D-camerawork techniques have been developed for creating 3D-computer games, sports broadcasting, and special effects of motion pictures. For such purpose, wire or mechanically controlled camera systems are normally used, but because of their huge and expensive infrastructures, application area is still limited. Our proposed system consists of a computer-controlled quadcopter, an automatic human tracking system based on computer vision, and a user interface for suggesting camerawork. By receiving a general command from the operator. 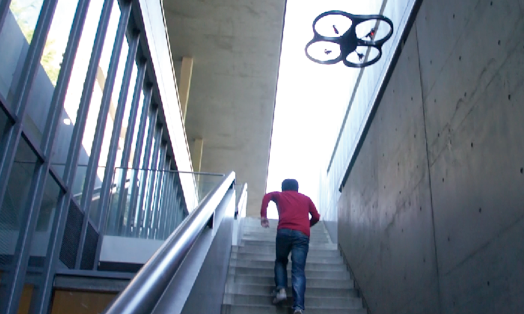 This system can also be used for other purposes, such as a flying sports assistant. Keita Higuchi, Tetsuro Shimada and Jun Rekimoto, Flying Sports Assistant: External Visual Imagery Representation for Sports Training, Augmented Human, Odaiba, Tokyo, Japan, 2011.